Since load-bearing walls are largely unnecessary in timber frame homes, fill your walls with glass to bring in as much natural light as possible. With more than 450 window companies in the United States alone, you have literally hundreds of choices and dozens of window decisions to make. Cost, energy efficiency, materials, and good design will all tug at your sense of economics and your designer’s eye. According to the National Association Home Builders, the average material cost of a 2,800-square foot home is $192,129. Of that, windows average $6,129 — or 3-4% of the budget. Timber home construction prices vary from basic home construction and the design of your home will ultimately determine the percentage of your costs that will be windows. 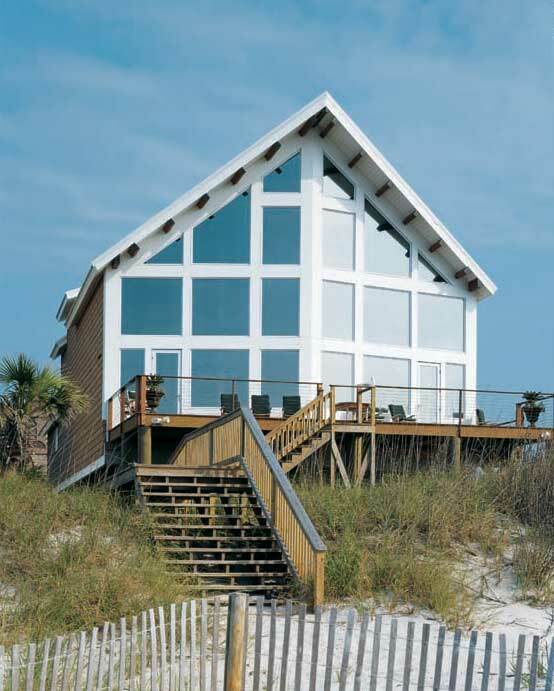 Some home plans call for large spans of glass, including picture and specialty windows. One tip to saving money is to group commonly-sized windows together rather than buying one large custom one. Common-sized windows are made in great numbers and are much more affordable. The local weather may help narrow your window choices. Wet, dry, hot, cold, high elevations, high winds… Energy efficiency is a priority when building a new home. Today’s windows offer drastic savings in this area with improved frame materials and glass options to save dollars, energy and time on maintenance. Where will the windows be located? What are the differences in frame materials? 1. Fiberglass. Relatively new in the window industry, fiberglass may not be widely available. With some of the highest R-values, fiberglass frames are excellent for insulating and will not warp, shrink, swell, rot, or corrode. Unprotected fiberglass does not hold up to the weather and should always be painted. Some fiberglass frames are hollow; others are filled with fiberglass insulation. 2. Clad-wood. Clad-wood frames have a regular wood frame that is protected by exterior layers of water resistant material (vinyl, fiberglass, or aluminum). Clad-wood is low maintenance, has very low thermal conductivity and comes in a variety of colors. Wood-clad frames are fairly expensive. 3. Wood. Wood-framed windows are popular with timber homeowners as wood stay true to the design and materials. Their fibrous makeup means they don’t conduct heat or cold, making them an energy efficient choice. Unfortunately, wood frames have issues with swelling, shrinking, warping, and water damage. 4. Aluminum. Aluminum frames have several advantages over wood: they’re more durable, weigh less, are thinner and easier work with, and are easy to transport. But while they’re also inexpensive and durable, they also tend to transfer heat out of your home at a high rate (unless you get a high-quality aluminum frame with an incorporated thermal break). They are available in a variety of color choices and can be coated to resist corrosion and can be painted to match your color scheme. 5. Vinyl. Vinyl frames are popular due to low cost and high insulation factors. They don’t conduct heat or cold in the same way that aluminum frames do, and they don’t have the maintenance problems of wood. Color choices are limited and painting may not be recommended (warping may occur from the sun if vinyl is painted a dark color), and the quality can vary greatly. Look for good welded corners and thick frames. Double hung windows provide a clean look to the front of a home. They are also useful near exterior decks, walkways and areas where people may be walking near the home. Casement windows project out when open and can be a hazard. Group several standard size windows together to create a large window wall instead of using more expensive fixed picture or casement windows. Look for a standard warranty of 20 years on glass, 10 years on frame/parts, 2 years on installation. New home construction can settle and therefore it is important to secure a warranty with your windows and protect yourself from future problems such as poor operation or material defects. Buy only energy-efficient windows carrying the National Fenestration Rating Council (NFRC) label. The NFRC label rates a window's energy performance and allows consumers to make apples-to-apples comparisons regarding U-Factor and Solar Heat Gain Coefficient (SHGC). The lower the U-Factor, the better the window prevents interior heat from escaping; the lower the SHGC, the better the window prevents unwanted solar heat from entering. Many states are now requiring all window products to carry the NFRC label. Check your local building codes for proper compliance. Movable insulation, such as insulating shades, shutters, and drapes, can be applied on the inside of windows to reduce heat loss in the winter and heat gain in the summer. Shading devices, such as awnings, exterior shutters, or screens, can be used to reduce unwanted heat gain in the summer. In most cases, these window treatments are more cost-effective than energy-efficient window replacements and should be considered first. For adding more dynamic light to a room, little can compare with a skylight. And unlike generations past when a skylight was an invitation to drips during the rainy season, today’s skylight — whether standard or custom — is a solid and sound architectural element when properly installed. Skylights today come in a wide range of styles, from the traditional single-slope fixed window that allows ample light to a remarkable range of multiple panes, grilled, angled, and weather-resistant styles. With rooflines varying in style and pitch in a single home, it’s also possible to create multiple angles from pyramids to trapezoids to nearly any style desired. About the only limitation (beyond imagination) are the structural considerations. Architects and engineers can guide the planner in determining those areas in which structural integrity may be compromised, even though glass strength, frames, mullions and grilles are much stronger than they were years ago. Whether the homeowner wants just a little added overhead interest, or something all the way up to a large solarium, manufacturers and builders are able to deliver. Do you have more window questions? Check out these tips on window hardware.